Nok Air is well placed to build on its strong position in the Thailand domestic market and fend off potential new competitors following an initial public offering which raised THB4.875 billion (USD156 million). The Thai Airways affiliate will use the proceeds to expand its fleet to at least 30 aircraft by the end of 2015 with a focus on growing existing domestic routes. Nok already offers Thailand’s largest domestic network with 22 destinations and 24 routes. About half of its routes are served with turboprops, giving the hybrid carrier a leading position in Thailand’s regional market. Overall Nok is the third largest domestic carrier in Thailand behind Thai Airways and Thai AirAsia, but has been rapidly closing the gap with Thailand's largest LCC. Nok faces bigger challenges in establishing an international presence but at least for now will primarily focus on the domestic market, where there continues to be growth opportunities but also intensifying competition. Nok’s expansion into the international market will be gradual and modest with a focus on niche routes. Nok Air began trading on The Stock Exchange of Thailand on 20-Jun-2013 under the symbol NOK. Trading began at THB26.75 (USD0.86) per share, slightly higher than the THB26 (USD0.84) price during the offer period of 12 to 14-Jun-2013. The stock, which has traded as high as THB29.75 (USD0.96), closed at THB26.50 (USD0.85) on 24-Jun-2013. The IPO included issuing 125 million new shares, which resulted in a 20% dilution, and selling 62.5 million existing shares. Nok was established in 2004 by Thai Airways and a group of nine smaller investors. Thai Airways did not elect to sell any of its existing shares during the IPO process but also did not buy any of the new shares. As a result Thai Airways now has a leading 39.2% share, down from 49% prior to the IPO. Five of the other original investors also kept their shares: Crown Property Bureau or CPB (6% stake reduced to 4.8%); Nok CEO Patee Sarasin (5% stake reduced to 4%); Siam Commercial Bank (5% stake reduced to 4%); King Power (5% stake reduced to 4%); and Supapong Asvinvichit (5% stake reduced to 4%). Nok over the last two years has been an important component of Thai’s multi-brand strategy for fending off growing LCC competition in its home market. Thai Airways increased its stake in Nok from 39% to 49% in late 2011. The additional 10% was purchased for only THB165 million (USD5 million) from Krung Thai Bank, which was also one of the 10 original investors. The value of this stake has since increased about ten-fold as Nok is currently valued at THB16.56 billion (USD532 million). At the same time Nok’s management team, led by Mr Patee, created a new investment company to acquire a 25% stake from three other original investors – Dhipaya Insurance, the Government Pension Fund and ING Funds. This stake has been sold down as part of the IPO. Thai Airways gained control of Nok’s board after buying the additional 10% stake. From late 2011 to Jan-2013 Thai accounted for five of the nine seats on the Nok board. In Jan-2013 the total size of the board increased to 12 seats as Nok was converted from a private to public company in anticipation of the IPO. As Thai Airways did not appoint any of the new board members, retaining five seats of the new total of 12, it no longer has control. The change in the board in theory gives Nok more independence. But Nok along with Thai Smile, which is positioned as an upmarket hybrid carrier, is still a vehicle used by Thai Airways for competing in a changing marketplace. AirAsia has emerged over the last several years as a major player in Thailand. The AirAsia Group launched an affiliate in Thailand in 2004 and currently accounts for about 16% of system-wide seat capacity. This includes AirAsia’s approximate 27% share of Thailand’s domestic market, which puts its just fractionally ahead of rival Nok. Thai AirAsia also currently accounts for just under 8% of international seat capacity in Thailand’s international market with AirAsia Berhad (Malaysia) accounting for another 3% and Indonesia AirAsia 1%. Overall this gives the AirAsia Group a 12% share of capacity in Thailand’s international market, second only to the 30% share from the Thai Airways Group (includes Thai Airways and Thai Smile). The AirAsia brand is poised to further close the gap with Thai Airways in the international market as AirAsia starts to compete with Thai Airways on medium/long-haul routes, including in the large Thailand-Australia market. Malaysia-based AirAsia X is planning to establish a joint venture carrier in Thailand which will operate widebody aircraft on medium/long-haul routes, likely starting in 2014. Thai AirAsia also has accelerated expansion since the May-2013 IPO at parent Asia Aviation raised USD143 million, most of which is being used for new aircraft. Asia Aviation now owns 55% of Thai AirAsia, with the remaining 45% owned by the Malaysia-listed AirAsia Group. Thai AirAsia is expanding its fleet in 2013 from 27 to 35 A320s. According to Asia Aviation’s 1Q2013 investor presentation, the carrier’s plan calls for another seven A320s in 2014, followed by six in 2015, six in 2016 and seven in 2017. This will give Thai AirAsia a fleet of 61 A320s by the end of 2017. Thai AirAsia currently operates almost 200 daily flights to 32 destinations, 19 international and 13 domestic, according to Innovata data. The carrier has been increasing capacity in both the domestic and international market, primarily by adding frequencies on existing routes. Thai AirAsia has been adding capacity on several domestic trunk routes in an attempt to widen the gap with Nok. On the largest domestic route in Thailand, Bangkok-Phuket, Thai AirAsia now has 10 daily frequencies compared to just three for Nok. On the second largest route, Bangkok-Chiang Mai, Thai AirAsia also has 10 daily frequencies compared to five for Nok. Thai AirAsia also recently added an eighth daily frequency on Bangkok-Hat Yai and a sixth daily frequency on Bangkok-Krabi. Nok has seven daily flights on the Bangkok-Hat Yai route but does not currently serve Krabi. But Nok’s position in Thailand’s smaller markets is much stronger. Thai AirAsia is starting to target some larger secondary markets. For example, Thai AirAsia has added a third daily frequency to Nakhon Si Thammarat, which is Thailand's 11th largest airport and one of the smallest destinations in the Thai AirAsia network. Nakhon Si Thammarat is a strong Nok market which it serves with five daily frequencies. But Thai AirAsia is unable to penetrate most of Nok’s smaller markets because of its focus on the pure LCC model with all-A320 fleet. Nok follows more of a hybrid model and has two types of turboprops, the 34-seat Saab 340 and 66-seat ATR 72, along with 189-seat 737-800s. It uses the turboprops to serve markets which are too thin or cannot accommodate jets because of runway restrictions. Of Nok’s 24 routes, 11 are served with turboprops, 12 with 737-800s and one with a mix of both (Bangkok-Phitsanulok). The 737-800s are used on all of eight of its primary/trunk routes, two of its three secondary routes (Bangkok to Phitsanulok and Trang) and three of its 13 feeder routes (Bangkok to Sakhon Nakhon and Nakhon Phanom and Chiang Mai to Hat Yai). Nok refers to Chiang Mai-Hat Yai as a “feeder route” but it is more a point-to-point hub bypass route which was launched in Jan-2013 with one daily flight. Thai AirAsia responded by adding a second daily frequency on Chiang Mai-Hat Yai, which is the longest domestic route for both carriers and the first jet route for Nok that does not touch Bangkok. Nok also competes with Thai AirAsia on Bangkok-Nakhon Phanom. But it faces no competition on its other 737 feeder route, Bangkok-Sakhon Nakhon. Thai AirAsia has traditionally been strongest in domestic markets that attract a large volume of foreign passengers such as Phuket and nearby Krabi. AirAsia will continue to be the market leader in such markets, leveraging its more international brand. Nok is an unknown outside Thailand but has a very strong local brand and a strong domestic distribution network, where it has been innovative in offering alternative payment channels such as convenience stores. Nok has been growing more rapidly than Thai AirAsia over the last year. Nok in Jul-2013 will offer about 131,000 weekly domestic seats in Thailand, up over 40% from Jul-2012. Thai AirAsia will offer about 132,000 weekly domestic seats, up about 26% from Jul-2012. 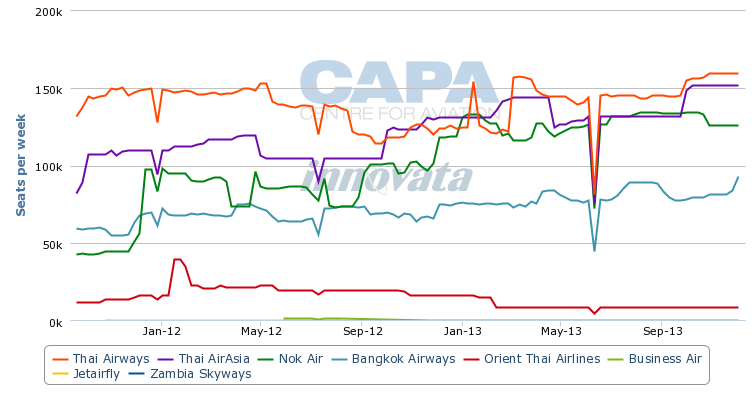 Based on current forward schedules from Innovata, Nok will overtake Thai AirAsia in Aug-2013, when Nok further increases domestic capacity to about 134,000 weekly seats. But Thai AirAsia is expected to retake the number two spot behind Thai Airways after Thai AirAsia increases domestic capacity in Oct-2013 to about 151,000 weekly seats. For the full year Thai AirAsia will almost certainly still carry more domestic passengers than Nok. But the gap will continue to close. In 1Q2013, Thai AirAsia carried 1.6 million domestic passengers compared to 1.4 million for Nok. In 2012 Thai AirAsia carried 22% more domestic passengers than Nok (5 million compared to 4.1 million). In 2011 the gap was 32% and in 2010 the gap was 50% (see background information). Thai AirAsia, however, will remain a much larger (and higher profile) carrier overall given the strength of its international network. Nok generated THB2.826 billion (USD90 million) in revenues in 1Q2013, representing a 51% increase compared to 1Q2012. But revenues at Thai AirAsia were still more than double, at THB6.03 billion (USD194 million), representing a year-over-year increase of 24%. Nok reported a THB416 million (USD13 million) profit for 1Q2013 compared to a THB739 million (USD24 million) profit for Thai AirAsia. That gives Nok a slightly higher profit margin, 15% compared to 12%. But both margins are healthy and well above industry norms. The high profit margins and consistent profitability of Nok and Thai AirAsia were a key factor in both carriers’ successful IPOs. Nok has been profitable the last four years and has been in the black every year since it launched except 2007 and 2008. During the global economic downturn it aggressively cut capacity and costs, which allowed it to weather the storm without having to ask its shareholders for new capital. Nok launched with only THB500 million (USD16 million) in capital and, incredibly, has not once needed a single recapitalisation. The original investors have been well rewarded for their investment as the company is now valued at over 30 times the initial investment. But the success of Nok and Thai AirAsia as well as their continued growth in Thailand’s market also attracts potential new entrants. Indonesia’s Lion Air Group is in the process of establishing an affiliate which, if launched, could significantly intensify competition in Thailand’s market. Lion could potentially impact Nok more than AirAsia if it adopts a hybrid model for its Thailand joint venture similar to the model used at its new Malaysian joint venture, Malindo Air. Malindo now operates 737-900ERs in two-class configuration and ATR 72 turboprops. Malindo offers complimentary checked luggage, drinks and meals as well as seatback in-flight entertainment in the 737. A turboprop fleet at Lion’s Thai joint venture would allow the new carrier to enter regional markets that are now served by Nok but not AirAsia. Nok is also a hybrid carrier with its product offering, which includes complimentary checked bags, snacks and drinks. Nok previously offered a business class cabin but phased it out as it transitioned from 737-400s to 737-800s. Nok is now in the process of returning its last 737-400 and in recent months has only used its remaining 737-400s as spares. Nok does not plan to reintroduce a business class product domestically and only offered it during the last few years because it inherited two-class aircraft from Thai Airways. But Nok has been looking at introducing a business class on medium-haul international flights which would require it configuring some of its future 737-800s with two cabins. Nok is dipping its toe in the international market in Sep-2013 when it introduces international services to Myanmar. But its first two international routes since 2008 will be niche routes from Mae Sot, a small city on the Thailand-Myanmar border, operated with Saab 340s. Mae Sot currently does not have any international services. Nok is smart to avoid competition from AirAsia in the international market and find niche routes where it can leverage its strong local brand and use of smaller aircraft. Mae Sot to Rangoon and Mawlamyine are not major international routes but Thailand-Myanmar is a growing market and a market that has strong local sales in Thailand, which plays to Nok’s strength. Most other international markets in Thailand have stronger inbound traffic, making it difficult for Nok given its lack of an international brand. Nok plans to add more Thailand-Myanmar routes over the next year, including more regional routes with turboprops and Bangkok-Yangon with 737-800s. Bangkok-Yangon would put Nok in competition with Thai AirAsia along with four other carriers, but it is a huge market that can potentially support a sixth player. Nok will have the capacity in the medium to long term to pursue more aggressive expansion in the international market. But the carrier will likely remain relatively conservative and does not have big ambitions to become a major international player. Nok expects to have a fleet of 30 aircraft by the end of 2015. The 737-800 will be its mainstay, reaching 14 aircraft by the end of 2013. Nok took its first 737-800 in late 2011 and currently operates 12 of the type, according to the CAPA Fleet Database. All of the carrier’s aircraft to date have been leased and nearly all have been second-hand aircraft. But the IPO gives Nok the flexibility to place an order for new-generation aircraft. Nok also plans to continue growing its turboprop fleet, which gives it flexibility to enter and expand in regional markets including short-haul international services to neighbouring countries. In addition to Myanmar, destinations in Laos and Cambodia could potentially be served with turboprops, keeping Nok away from the most competitive of markets. Nok currently operates four ATR 72s and wet-leases five Saab 340s from Siam GA Airlines. Growth of the ATR 72 fleet is likely as Nok sees opportunities to up-gauge Saab 340 routes to the larger ATR. Nok added a third ATR 72 in 1H2013, which it has used to up-gauge Saab 340 flights. This in turn frees up capacity to use the Saab 340 to open new routes, both domestic and international. Nok has been successful using the Saab 340, which operates under the Nok Mini brand, at developing new markets with the new markets often growing to the point that they can support larger aircraft. Nok could operate as many as eight ATRs in the medium term. In addition to acquiring additional turboprops the carrier could replace its two original ATR 72s, which are owned by Thai Airways and are over 20 years old. Its two most recent ATR additions were sourced from leasing companies and are only six years old, according to the CAPA Fleet Database. The likely phase out of its two ageing ATR 72s would give Nok more independence from Thai Airways, which provided the carrier with all its original aircraft. In 1Q2013 Nok accrued THB56 million (USD2 million) in expenses that were paid to Thai compared to THB569 million in 1Q2012 (USD18 million). The decrease was likely driven by the return of several 737-400s which Nok was leasing from Thai. Nok also has a limited codeshare with Thai Airways covering routes which the main carrier no longer operates. But the benefits of the codeshare are limited as Thai Airways is based at Bangkok Suvarnabhumi while Nok operates from the old Bangkok airport Don Mueang, where Thai AirAsia is also now based. Nok reported only THB2.1 million (USSD67,000) in revenues from Thai in 1Q2013, a decrease of about 40% compared to 1Q2012. While there are limited synergies between Nok and Thai and the carriers' management teams are not close, Nok will continue to be an important component of Thai’s multi-brand strategy. Thai needs Nok and potentially a medium/long-haul LCC to respond to the continued growth of the budget end of its home market. 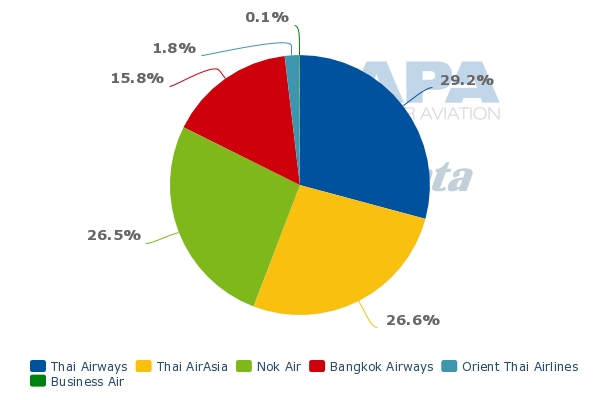 LCCs at Thailand’s six largest airports have seen their passengers grow by 28% in the six months ending 31-Mar-2013 (1HFY2013), according to Airports of Thailand data. This includes 24% domestic growth to 8.53 million passengers and 37% international growth to 4.55 million passengers. For full service carriers, the domestic growth was 9% for the same six months at the same six airports to 7.06 million passengers while the international growth was 20% to 23.05 million. This continues a trend over the last few years which has seen much faster LCC than FSC growth, pushing up the LCC penetration rate to 53% domestically and 16% in the international market. More LCC growth in the domestic and short-haul international market is expected as Thailand’s GDP is likely to grow another 6% in 2013, with GDP growth of about 5% per annum expected over the medium to longer term. While inbound tourism figures are also expected to grow, Nok has played more to the local sector and been very successful at appealing to Thailand’s fast-growing young middle class population. As the purchasing power of Thailand’s middle class grows, Nok is well positioned to grow as well. Its successful IPO is a testament to its successful brand and consistent profitability. The Thai market will also attract growth from other carriers and new entrants. But if Nok sticks to its roots it will continue to be a quiet over-achiever in Southeast Asia’s increasingly competitive LCC sector.